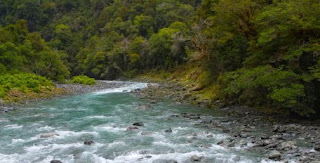 The Burke River in Mt Aspiring National Park. Since 1990, mineralogists have known that deposits of "Baotite", a carbonatite rock containing the "strategic mineral" Niobium, exist in and around the Haast Pass area. Niobium is crucial to the maintenance of the United States' global air superiority. ON 23 FEBRUARY, Foreign Affairs Minister, Murray McCully, was forced to relinquish (if anyone would have them) his 184 shares in Widespread Portfolios Ltd.
"Murray McCully has shares in a company that stands to benefit directly from National’s mining policy", thundered the Labour-friendly blogsite, The Standard. "As a member of Cabinet deciding this policy McCully has a significant conflict of interest." McCully’s holdings in Widespread Portfolios – a New Zealand-owned investment company specialising in mineral and oil exploration – was hardly a secret. The Standard’s story was based on information which the Minister himself had provided for the parliamentary Register of Pecuniary Interests in January 2009. But, like Caesar’s Wife, our Cabinet Ministers must be above suspicion. Accordingly, McCully announced his intention to divest himself of the offending shares (worth a princely $NZ31.63) at the earliest opportunity. In most respects it was. But, in one crucial respect, the story rolled on. The revelation of McCully’s shareholding in Widespread Portfolios – like the revelation of the Prime Minister’s tiny stake in the Australian-owned Jackson Mining company a few days earlier – had whetted their political opponents’ appetite for even the smallest scrap of evidence linking the policies of the National-led Government to the needs of the mining industry. A "scrap" like Inner Mongolia. The link was tenuous, to say the least: Widespread Portfolios Ltd had invested in an outfit called King Solomon’s Mines Ltd, a prospecting company searching for gold on the windswept plains of the Chinese Autonomous Region of Inner Mongolia. But what could this remote part of the world possibly have to contribute to our understanding of the New Zealand Government’s proposal to permit mining in its national parks? On 10 January 2010, Britain’s Daily Mail newspaper ran an exclusive story entitled "Inside China’s Secret, Toxic Unobtanium Mine". The Mail’s Richard Jones had somehow made it all the way to the heart of Inner Mongolia and been smuggled in to Baiyun Obo, a vast, open-cast mine off-limits to foreigners. According to Jones: "The rare-earths blasted out of rocks here feed more than 77 per cent of global demand for elements such as terbium, which power low-energy lightbulbs; neodymium, which powers wind turbines; and lanthanum, which powers the batteries of hybrid cars such as the Toyota Prius. "They are also used in mobile phones, computers, iPods, LCD screens, washing machines, digital cameras and X-ray machines, as well as missile guidance systems and even space rockets. Industries reliant on the rare-earths are estimated to be worth an astonishing £3trillion, or five per cent of global GDP." These highly-prized minerals with names mostly ending in "ium" have surfaced again, in documents released to the news media by New Zealand’s Energy & Resource Minister, Gerry Brownlee, on Monday, 22 March. "Rare earth elements are strategically important. There are very few players in the global market, which is likely to influence their value in the future. They include dysprosium, terbium, erbium and ytterbium, which are fundamental to technologies such as hybrid and electric cars, wind turbines, computer disk drives, fibre-optic telecommunication cables, low-energy light bulbs and military equipment." Brownlee is quite right to say there are very few players in the global market for rare- earth elements. As Jones notes in his article: "In 2008, China supplied 139,000 tons worldwide, 97 per cent of the world's total rare-earth production." In other words, China is in the enviable (not to say worrying) position of holding a near monopoly over the minerals which lie at the heart of the emerging "green economy". What’s more, according to Jones, China is steadily reducing the quantity of its rare-earth exports – a policy which will, eventually, require the manufacturers of "green technology" to re-locate their operations on Chinese soil. Nor are the serious strategic implications of China’s rare-earth monopoly restricted to the realm of economics, for the United States, in particular, the military implications are grave. "Baotite", for example, nearly all of which comes out of that huge hole in the ground at Baiyun Obo, contains not only a number of rare-earth elements, but also the "strategic mineral" Niobium. Without Niobium the turbine blades of jet engines cannot not be made strong enough for sustained supersonic performance. At present, the Americans, who have next to no Niobium of their own, get the bulk of what they need from Brazil (along with a tiny fraction from Canada). But no super-power enjoys being dependent on a single supplier – especially one located in the politically volatile continent of South America. What if Brazil went the same way as Venezuela and Bolivia? Where else, apart from China’s Baiyun Obo mine, could the United States turn for the Baotite/Niobium so vital to the maintenance of its global air superiority? How about Mt Aspiring National Park? Since at least 1990, New Zealand mineralogists have known that deposits of Baotite may be found along the South Island’s Haast and Burke Rivers, both of which are located in the Mt Aspiring National Park. In December 2009, the Green Party informed the news media that the Ngai Tahu iwi had been approached by the Crown for its likely response to the Government’s plan to remove the protected status of up to a fifth of the Park – an area to the north of Lakes Wanaka and Hawea, centred on Haast Pass. Interestingly, this is precisely the location of New Zealand’s Baotite deposits. Re-enter the Foreign Affairs Minister, Murray McCully. Long an advocate of the New Zealand pinky-finger being reabsorbed into the Anglo-Saxon Fist (the other "fingers" being the USA, the UK, Canada and Australia) would McCully be likely to refuse an American request to, at least, prepare this country for the day when its Baotite might be needed? He certainly wouldn’t encounter much in the way of opposition from Messrs Brownlee, Power and Joyce – the other members of Key’s "Kitchen Cabinet". And the Prime Minister’s (and Tourism Minister’s) attitude toward managing the economic/environmental trade-off is, as we have seen over recent days, entirely pragmatic. Quite how Trade Negotiations Minister, Tim Groser, would react is harder to predict. Certainly, he’d be unlikely to relish the prospect of explaining to the Chinese why New Zealand is undermining their rare-earth monopoly. This essay was originally published in The Independent of 1 April 2010. And we are still being fooled.But mind you most who believe in capitalisim being a vehicle for socialsim, do not need court jesters to entertain them. Is there any reason to think that rare earths exist in greater and/or more exploitable profusion in New Zealand than on the rest of the planet, excluding China? If so, are there significant deposits here, other than on sensitive conservation land? If so, might it be possible to exploit such deposits without causing the type of eco-catastrophe detailed in the Daily Mail article? If so, might there be merit in developing a niche as 'green' extractors of substances that seem essential to green technology? I suspect the answer to all four questions is a resounding 'No'. But I would like to base my scepticism on something other than my inherent cumudgeonlyness. Can anyone oblige with information or, failing that, educated guess work? Talking to a leftwing earth scientist today, he pointed out that there's plenty of baotite around, it's just in very low concentrations and not worth mining - you'd have to extract so much of the earth for little return. I would be very worried of they were talking about concentrations over 3%, but until then I am hopefully sceptical. That is a reassuring factoid, Solatnz. Let's hope our Baotite deposits are as diffused as everybody else's!